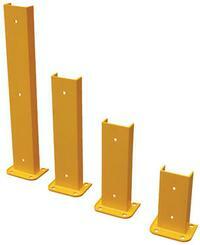 Economical way to protect against damage to pallet racking and wall corners. Constructed of 6" or 8" structural steel “C” channel. Available with (Pic. 2) or without (Pic. 2) a rubber bumper. 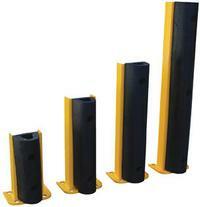 Easy to install to concrete surface. Four mounting holes for maximum stability. Safety yellow powder coat finish. Installation hardware sold separately. Model V-G-ABK - Concrete Anchor Bolts (4) 3/4" x 4"